MND is Dr. Scotter’s primary research focus. 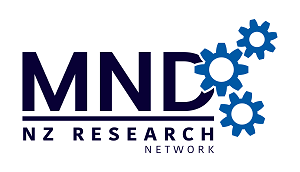 Establishing a national MND genomics platform- potential collaborators are welcome to contact Dr. Scotter. Dr. Scotter collaborates widely nationally and internationally on MND studies. Within the Centre for Brain Research she works with Professors Mike Dragunow and Richard Faull and Associate Professor Maurice Curtis. Dr. Scotter is on the Steering Committee for the NZ MND patient registry driven by Dr. Richard Roxburgh. She also collaborates on the genetics and cell biology of MND with Professor Christopher Shaw and Dr. Bradley Smith, King’s College London. Scotter Lab works with banked human MND brain samples collected by the NZ Neurological Foundation Douglas Human Brain Bank. They also work with human MND brain cells grown by the Hugh Green BioBank. Dr Scotter: “Personnel. Funding for postgraduate and postdoctoral researchers specifically in MND research is required to build capacity in MND research in NZ. Connections between NZ researchers with any MND research interest are also essential if we are to characterise MND here at home”.